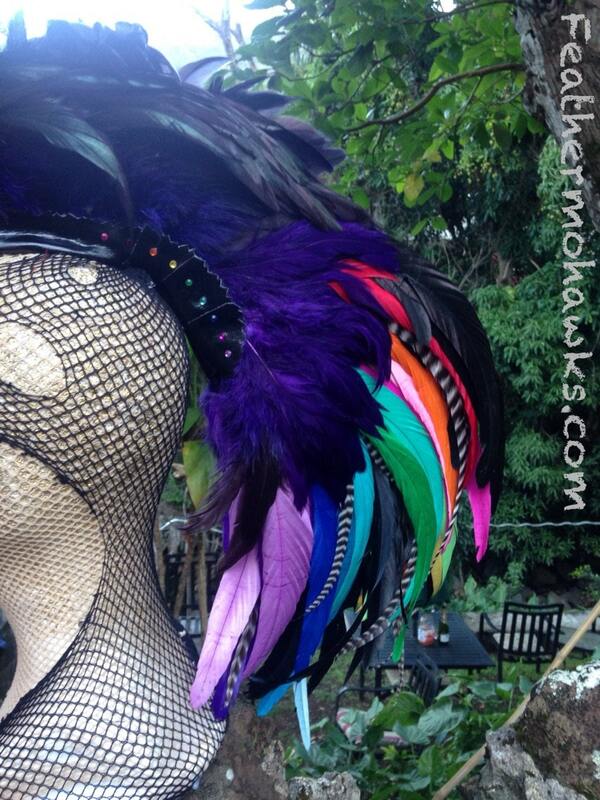 Customizable Feather Mohawk / Headdress - "Dhara"
Dhara is short and sweet with vibrant purple an array of Rainbow Yumminess at her tail! 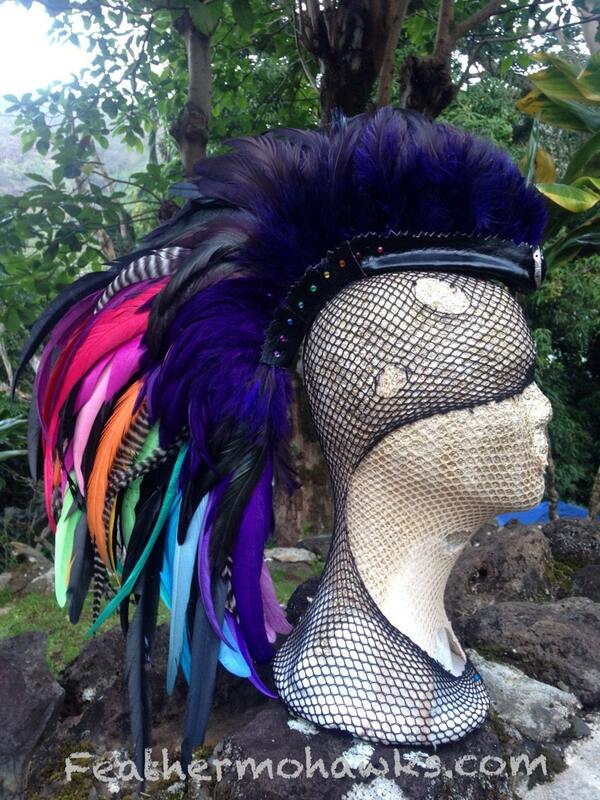 Rock out with your hawk out and feel like a God/Goddess in your one of a kind, ‘MADE JUST FOR YOU feather mohawk!!! 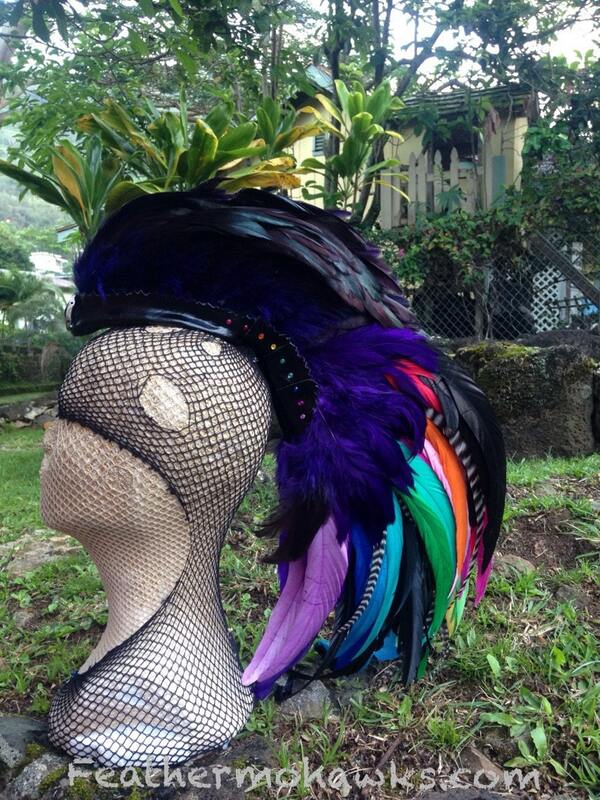 **This piece is made to order. The piece in this photo has been sold. Please allow 2-4 weeks for completion unless you specify a due by date during checkout. The sooner you purchase the better so that I can ensure that I have all materials on hand when you order. *** It helps me greatly if you can tell me the due by date so I can ensure I get it to you by when you need it! Want a discount? Contact me for details on how... I also take payment plans - if you cannot afford my prices please don't hesitate to talk with me on how we can work something out for you! Please note that the pieces you see in these photos are not the same one you will be getting, but made to be in the same badass style! Each piece has a small medallion / pendant on the front unless you prefer to have none. Please specify if you would like a custom jewelry silver/bronze/gold based medallion. (won't be real gold/silver/bronze unless you would like to pay extra for the cost) **********If you do not specify, I will make the call on what pendant to select. Each pendant is different so I will add whatever I feel looks best but you can always remove whatever I put on it and put one of our own if you prefer. Absolutely, in fact, part of the deal is that I will send you a photo before I mail it, unless you're not interested in seeing it (so far, most are so excited about their feather mohawks that they can't wait to see photos before they get it!). I want you to be thrilled and excited when you pull your mohawk out of the box. before shipping, I will email you some photos of the exact one you will be getting so that I get your seal of approval!